Beginning in about 2018 genetic research finally began to reveal the extent to which, and speed with which, ancient societies spread themselves all over the earth. The old "out of Africa" land migration story has now been relegated to the trash heap of BS (bad science), and yet it will still take decades for many scientists to accept, as it changes just about every anthropological notion arrived at in 200 years since Darwin. Oh well. Our approach is deductive, rather than inductive. Starting with the assumption that ALL major races of Man began plying the sways early on in their rise to consciousness, we were looking for correlations between his voyages, and his interactions with other reaches and peoples. 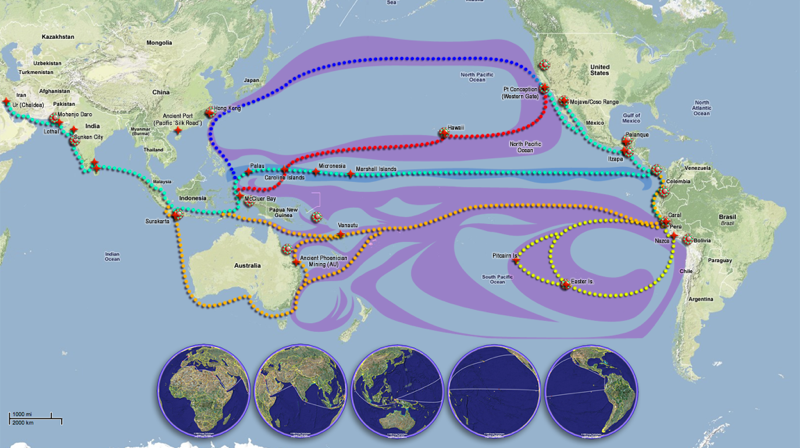 By mapping the Pacific (and Atlantic) Ocean's major Equatorial Currents, and Equatorial Counter-Currents, and overlaying the discoveries of anomalous, advanced scientific knowledge, locations of major (maritime) civilizations, occurrences of Haploid Gene-X (coding for green eyes and red hair), locations of peoples who retained legends of the Homo floresiensis (aka Kunlun), giants, and locations of alchemical and astrological petroglyphs, we felt we could visualize the major maritime corridors used by these early peoples. This map, although an on-going project, does fulfill our designs for it. At a glade we can see many of the connections between these global current and the transoceanic presence and concentrations of these ancient races, along these corridors.